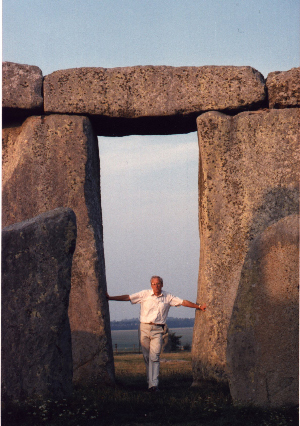 Frequently Asked Questions - leading to the theory of Stonehenge. (National Grid Reference SU 123 422). 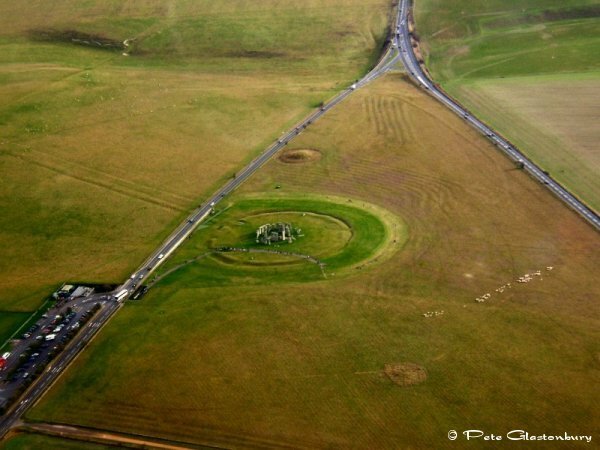 WHAT WAS STONEHENGE USED FOR, AND WHY? These are the most testing questions. Before outlining the most plausible answers in accordance with the facts of the latest archaeological and scientific scholarly research, a summary of the chief features of the monument are introduced. 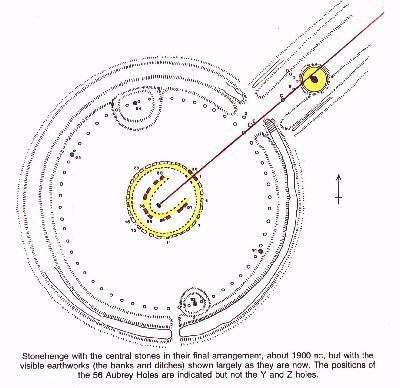 A link to the theory of Stonehenge is then provided near the bottom of this page. WHEN AND HOW DID STONEHENGE BEGIN? For some 400 years beginning about 2950 BCE the site was little more than a simple circular earthwork, inside of which was a space about 85 metres or some 90 yards in diameter but at the centre of which there appears to have been a simple wooden structure or timber circle. A ring of 56 pits lies close to the circumference of this open space, and according to the argument presented by Cleal, Walker and Montague (1995) every pit formerly held a timber post, thus forming a large-diameter timber circle. The holes left after the decay of the ring of posts are called Aubrey Holes. The Neolithic people later filled these pits with chalk and re-used them for ritual deposits. The major causeway opening to the north-east embraces the direction of the most northerly risings of both moon and sun. Not until about 2550 BCE did construction of a ring of stones commence. There being no natural stone on this part of the chalk plain, the stones had to be imported. WHENCE? The first choice of stones, called bluestones, came from South-West Wales, 200 km to the west. Between 60 and 80 bluestones arrived, each weighing 3-4 tons, and there was one exceptional stone at 8 tons which was placed near the centre, on the summer solsticial axis, at the focus of the monument. The later sarsen stones, weighing between 6 and 60 tons each, were dragged about 32 km (20 miles) southwards from near Avebury. Sarsens are the fractured remnants of ancient sandstone beds dating from the Eocene some 26 million years ago. The photograph, taken in the direction of midsummer sunrise, indicates the immensity of the sarsens of the outer ring. The overhead lintel, which weighs about 6 tons, is supported by 25-ton megaliths. WHEN DID THE STONES ARRIVE ? The bluestones came about 2550 BCE, possibly at a rate of just a few (3 to 6, say) annually. At some point, delivery of the bluestones stopped. This happened before the ring of bluestones had been completed. Fairly soon afterwards, sarsen stones started arriving, and their delivery is presumed to have taken one or two centuries commencing about 2500 BCE. HOW ? The bluestones were rafted from Wales by sea and river. The sarsens were dragged from the Avebury Hills by haulage teams, probably aided by oxen. The stones were then tipped end-first into pits dug into the sub-surface chalk The lintels for the trilithons were raised on wooden cribs or by using earthen ramps. BY WHICH ROUTES? (1) The bluestones came along the Bristol Channel, then possibly up the River Avon to Bath and overland to the River Wylye at Warminster; thence to Salisbury and Amesbury via a second River Avon to Stonehenge. A ditch-and-bank avenue from the latter river to the monument likely marks their final journey. An alternative possibility is a sea-crossing via Lundy Island (as suggested by Rodney Castleden) and then around the Cornish Peninsula to the Salisbury Avon. (2) The sarsens went probably south-west from the Avebury Hills to a col near Devizes and West Lavington, and then south and east across the chalkland. WHAT WAS THE MASTER BUILDING PLAN? The first sarsen stone erected may have been the huge Heel Stone, set outside the monument. Also early were the 4 station stones, placed within the circular ditch near the Aubrey ring. A circle of bluestones was commenced but the stones were dismantled after 60 had been raised. Sarsen circles and U-settings then went up, the dominant feature being the trilithon idea of a 6-ton lintel lying across pairs of 25 to 60-ton uprights. In the final stage, the bluestones were put back, some in a circle, the others on a U-setting. The common axis of all the sarsen stones and the bluestone settings is towards the midsummer sunrise. The sparkling 8-ton bluestone went to the heart and focus of the monument where the rays of the rising sun can fall on it only for a few minutes each year at the time of midsummer solstice. It was a devout, clever people who did this. Who were they? They were the Ancient Britons, part of a precocious flowering of an early World Culture---and until recently inadequately recognised and ill-understood by us, their inheritors. Their names are unknown. Begun in the agricultural Neolithic Age, Stonehenge was completed in the Early Bronze Age by Beaker folk. At a later date (perhaps towards 1500 BCE) some disaster or systems collapse progressively brought the impressive Megalithic Age to an end, not only here but throughout the whole of Britain and Ireland. Much further east, as in Egypt, Babylonia and the Indus Valley, civilisations continued to flourish, although in Crete towards 1400 BCE a splendid high culture was also nearing its end. This is a plan of the stones as they were at the end of the final stone-moving phase, nearly 4000 years ago. The 8-ton Cult Stone is on the main axis at the focus close to the centre. For a plausible theory and likely answers as to WHY Stonehenge was designed like this, CLICK HERE. One of the great trilithon stones has numerous axes carved into it; another has a Mother-Goddess type of image carved in relief; and a third bears a splendid carved image of a distinguished human head facing west.